Each teacher’s manual consists of 13 lessons, a set of visuals and a set (or a CD) of student leaflets. The visuals consist of a spiral bound flipchart and patterns for verse memorization and handcrafts. The flip chart is full color. The students packet contains one student leaflet for each lesson. At least one side of each leaflet is full color. There is also an attendance chart and stickers to glue on it. 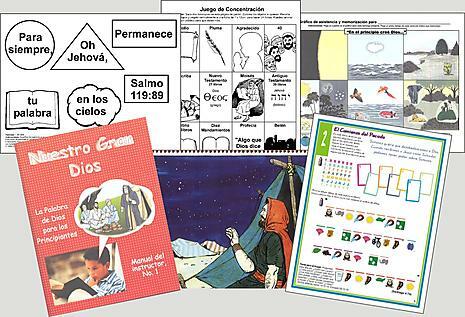 The configuration of Primary Sunday School materials has changed. One student packet (or CD) is now included with the purchase of the teacher’s manual. Likewise, an unlimited number of copies of the student’s packet can be made for your church ministries. Copies cannot be shared with other churches or ministries. If the $1.25 price is listed beside the title, additional printed copies of the student packets are available. If the price of $2.00 is listed beside the title, this means that only a CD with PDF files is available. These PDF files can be reproduced. A study of what God did in creation and in the lives of Abraham and Jacob. A study of the promised Saviour, prayer and worship. A study of the earthly life of Jesus and the life of Paul. A study of the life of Joseph, Joshua and Daniel. A study of how God cared for several different Bible characters. A study of the birth, ministry and miracles of Jesus Christ. A study of the power and love of Jesus Christ and the importance of believing in Him. A study of how obedience, trusting and being kind pleases God. A study of the life of David. A study of faith in God as seen in the life of several Bible characters.